local streets during the Second World War. 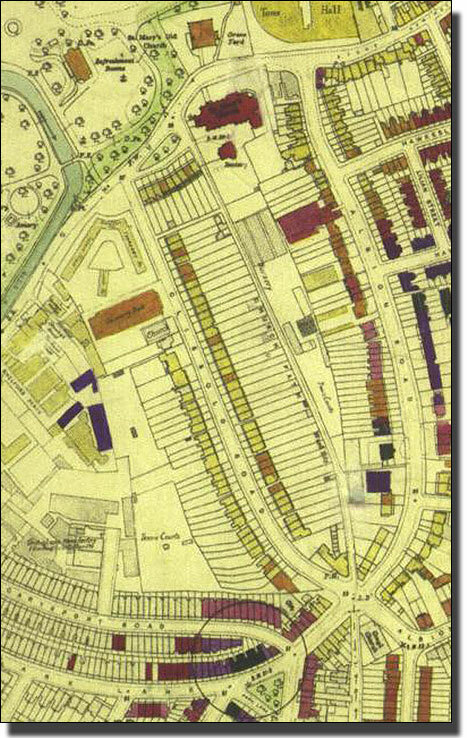 The Bombing map of the area round Clissold Road. o small circle V2 long range rocket. Clissold Road on the bombsight.org website. By 1980s the road was in a sorry state. Second World War bombing, lack of maintenance over many years, and uncertainty about what was going to happen to the houses, meant the situation got worse and worse. New blocks were being built nearby. 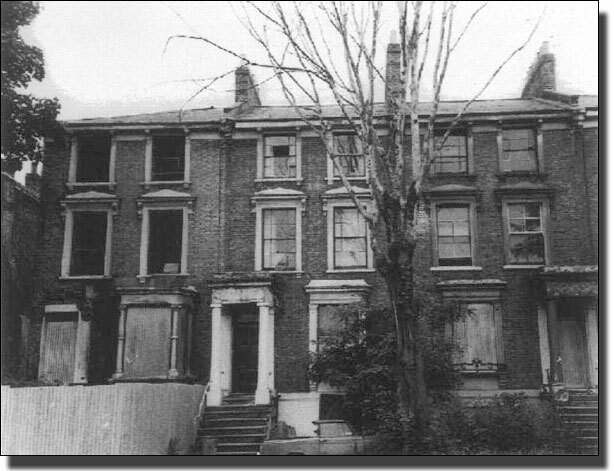 The Hawksley Estate in Albion Road and the Burma Estate had been built. Avon House and Medway House on Albion Triangle and Crawshay House in Clissold Crescent were all built in the 1970s. These were al new-builds, where the architects could build new blocks of flats on demolished bomb sites. People were not just sitting on their hands, but the housing problem was so enormous that everything had to take its turn. In the meantime, people who could find nowhere better to live, forced their way in and ‘squatted' in the houses. The Local Council was sympathetic to their needs, but for the moment they could not help, so they licensed some of the houses to groups of people who were trying to house people wherever they could. 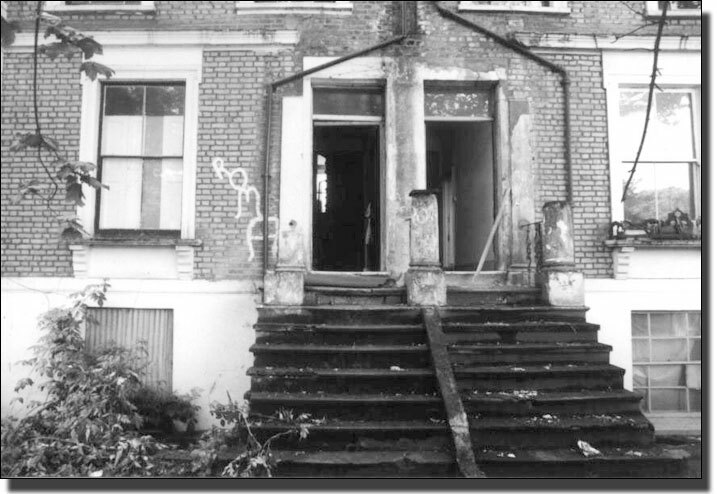 The Peter Bedford Housing Association, The Artists Co-operative, and others were granted licenses so that people could live in the dilapidated houses but the Council did not want to set up tenancies, so they granted licenses. In this block some of the houses have been completely deserted. The left hand one is closed off with corrugated iron as if it was a dangerous structure. The centre one still has curtains, so squatters may still have been there. The whole road was like this, dangerous structures and squatters side by side. The road was at its lowest ebb but it could not be demolished. It had to be restored. 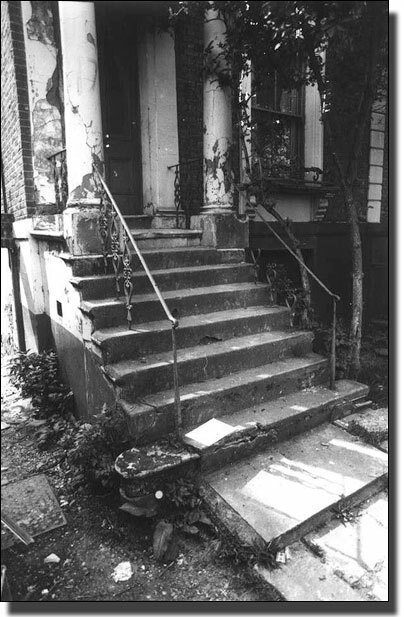 The front steps were broken and dangerous, with some cast iron banisters missing. 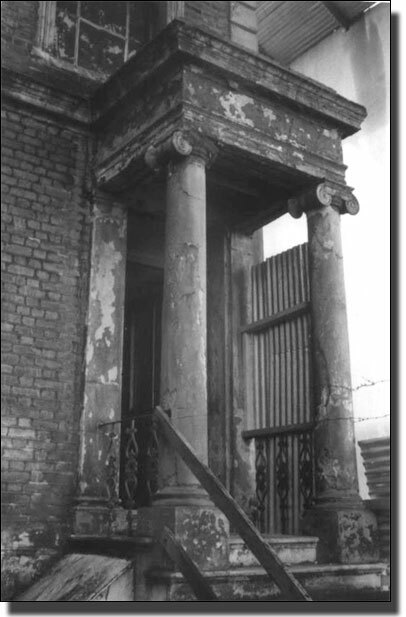 This was a typical portico in 1981. The railings to the front steps had been lost and replaced with some rough timbering. Presumably someone must have stolen the iron railings and sold them for scrap. Nos. 27 and 29 were even worse. The complete porticos had been demolished, probably because they were dangerous. All the railings had gone and the basement was shuttered off with corrugated iron. 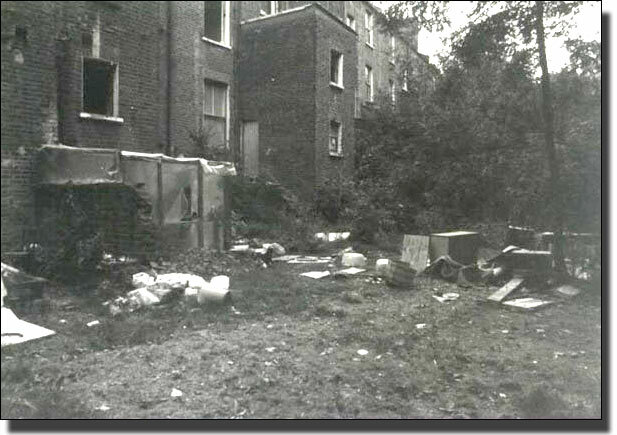 The backs of the houses had window frames missing and the gardens covered with rubbish. 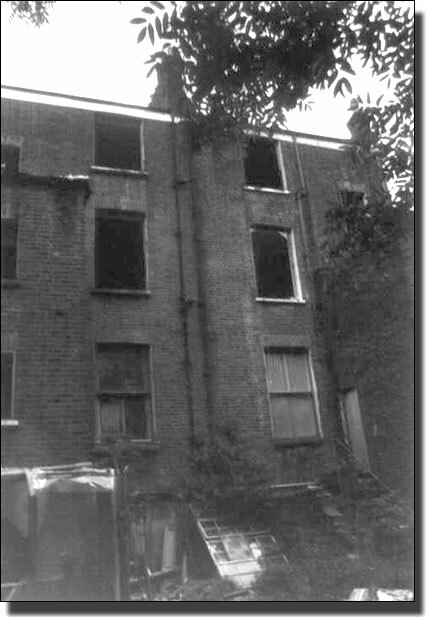 The backs of the houses were bleak, unlovely, and a prey to vandalism.